I've been yearning for a personalized necklace, something that honors my daughters. I've been looking around for quite some time now, and most I have seen are either too expensive or are of poor quality. I haven't been lucky enough to find one that falls somewhere in the middle. 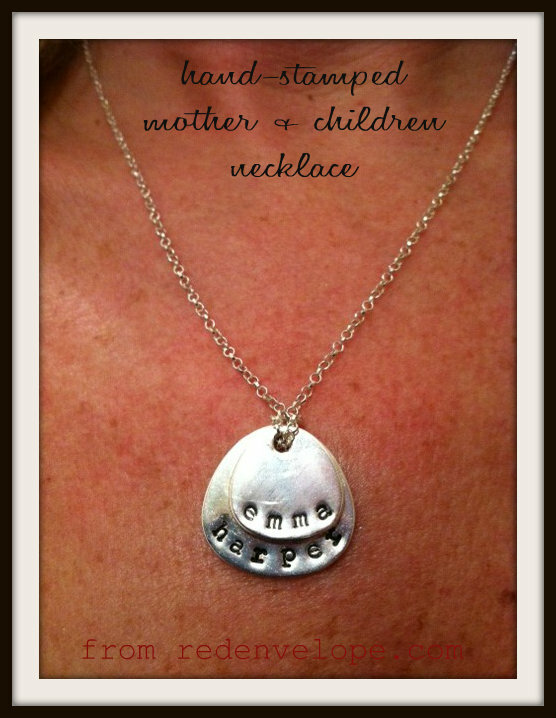 A personalized necklace that can be worn everyday to do everyday mom tasks but also one that can be worn out to a nice dinner would be ideal. When I was invited by Red Envelope brands take a look at the jewelry offerings and make a selection for $65, I was delighted. I couldn't wait to take a look at the selection and the prices. I was familiar with Red Envelope, but I had never ordered from the site before. It didn't take me long to hop on RedEnvelope.com and start browsing. There were so many beautiful pieces to choose from. From necklaces, bracelets, and rings to jewelry trees and boxes, there was something for every jewelry lover. I zeroed in on the necklaces. 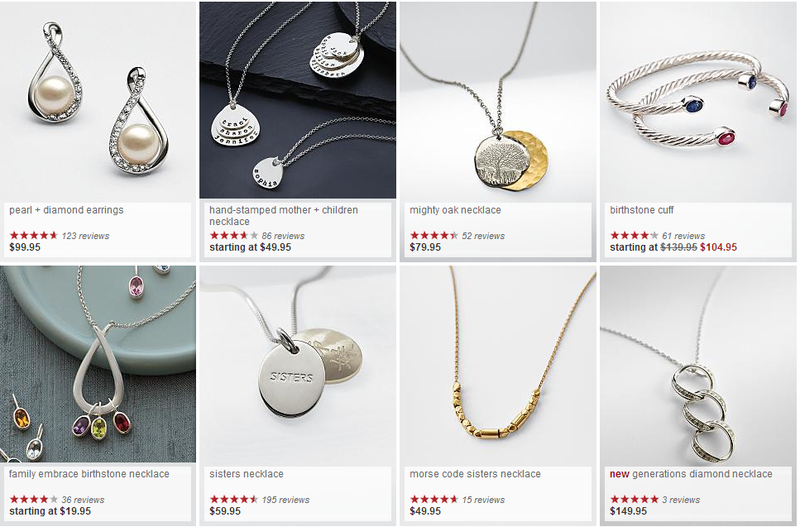 My eyes went directly to the "hand-stamped mother + children" necklace, but I also loved the "Sisters" necklace. That would be the perfect gift to give my three sisters. I went in for a closer look. I was in love. I could picture my daughters names on this necklace draped around my neck. The big question was, "How much does it cost?" 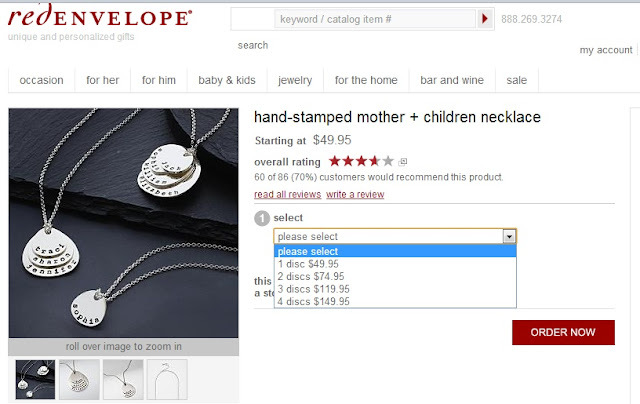 The necklace with one disc started at $49.95. 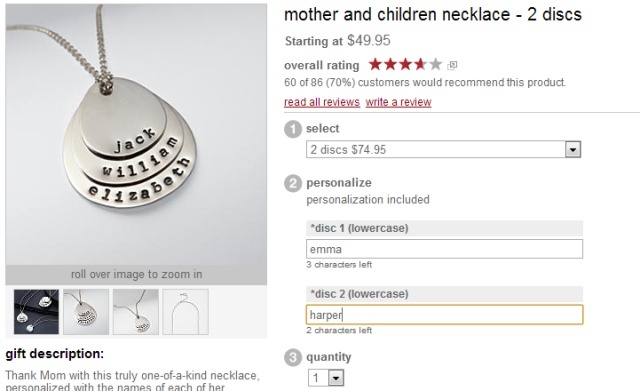 I obviously needed a necklace with two discs, which costs $74.95. I was sold! I wanted this necklace, and I wanted it NOW! I placed my order easily and quickly. The personalization was straightforward and easy to do. 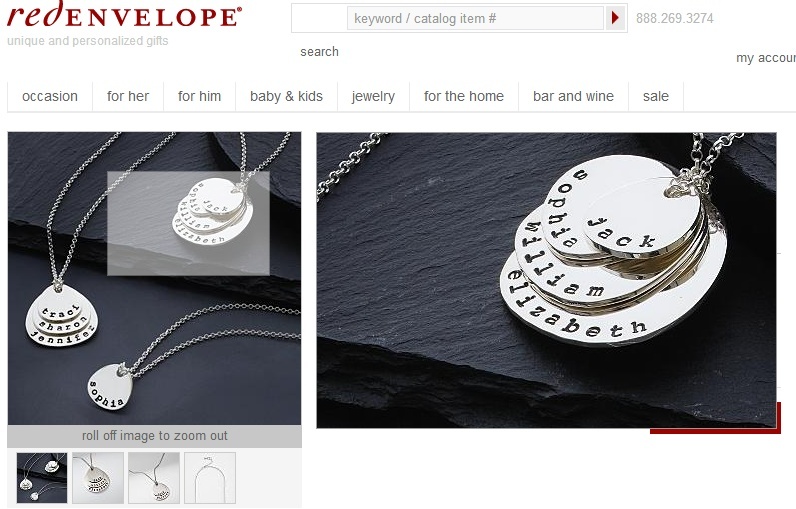 I should point out that only lowercase letters are used for this particular necklace. I didn't mind though. I actually liked the appearance of the lowercase letters. One of the aspects I love about ordering from one of the Red Envelope brands is that the buyer can specify the exact date on which the item is received. This is particularly helpful if you want to give the item as a gift but don't want to be hanging on to the item for weeks prior to the gift-giving occasion. My necklace arrived in a red box. It was so pretty. 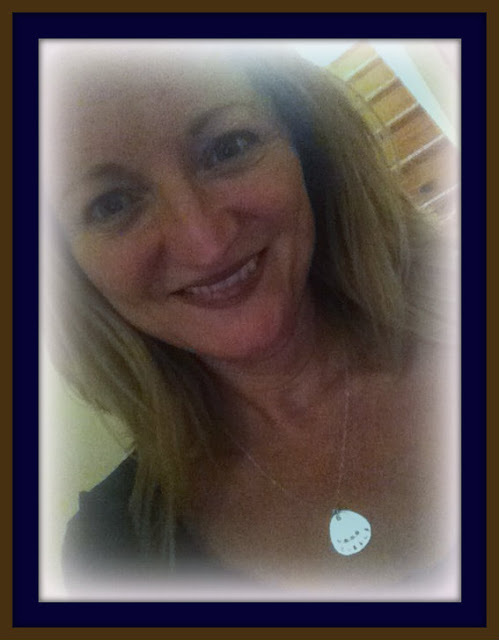 I put it on immediately, grateful that I was wearing a v-neck top on the day the necklace was delivered. I haven't taken it off since. If you are looking to purchase a gift of jewelry, think outside the box (haha! get it? outside the jewelry box). 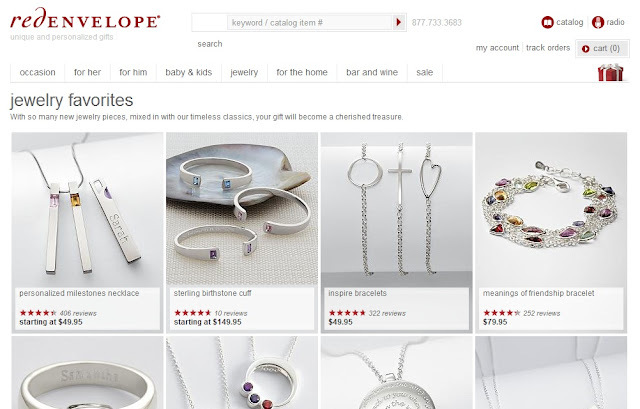 Look beyond your typical big name jewelry stores and try Red Envelope instead. The selection may be smaller than the big jewelry stores, but I am overwhelmed in those stores. Too many decisions to make. Red Envelope has just the selection and the quality that I am looking for. If you find something that you just must have, you can find coupon codes here. 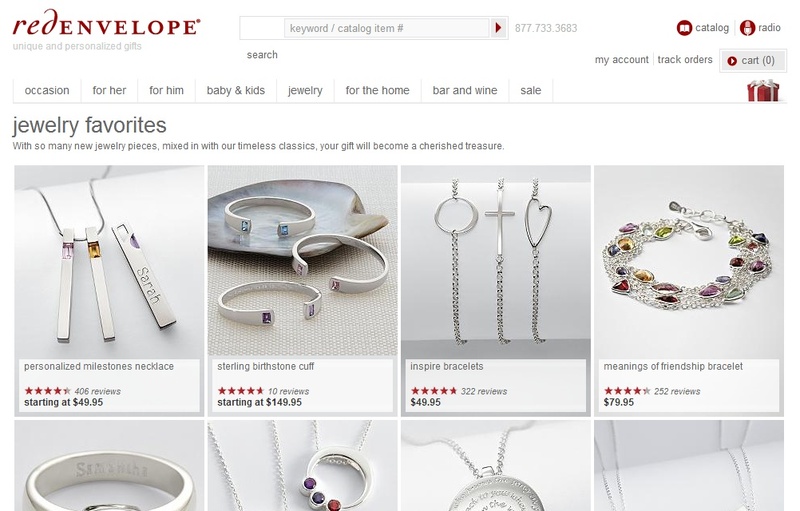 They include everything from free shipping to 25% off your order of $75. Some really great coupons, so be sure to check them off before you make a purchase. If you do buy something, please come back and let me know what you bought. I'd love to know! Disclosure: I received a $65 credit to shop at RedEnvelope.com. I was not compensated for this post. All opinions are my own. Since When is an RSVP Optional?